Poetsch (third from right) and Mueller (center) at VW's annual meeting today. HANOVER, Germany -- Volkswagen Group Chairman Hans Dieter Poetsch bore the brunt of investor dissatisfaction over the automaker’s handling of its emissions cheating scandal during the company's annual shareholder meeting, with some even trying to remove him as host of the gathering. Poetsch received a tongue-lashing from investors for his shift last year from chief financial officer to the head of the supervisory board, which has oversight over top management. Underscoring the sour mood, some investors asked to have Stephan Weil, premier of VW's home state of Lower Saxony and a VW board member, take over the meeting held on Wednesday. The motion was turned down. "You are a conflict of interest personified," said Markus Dufner, managing director of the German Association of Ethical Shareholders. Dufner and other shareholders expressed deep reservations over having Poetsch oversee the cleanup of a scandal that began while he was CFO. "I see a massive conflict of interest if he leads the investigation of the diesel affair," Hans-Christoph Hirt, co-chief executive officer of shareholder advisory group Hermes Equity Ownership Services, said of Poetsch. Shareholders tried twice in the first 4 1/2 hours of the gathering, which often descended in shouting and arguing, to unseat Poetsch as meeting chairman. Investors questioned when they would get full information on the crisis, bemoaned the job management has done reacting to it and expressed doubt about Volkswagen’s ability to turn itself into a electric-car maker with the latest in autonomous technology. "We are looking at a shambles," said Ulrich Hocker of Germany's DSW association of private investors, saying the decision to rig emissions tests was a "collective failure" by the nine-member management board. "We had hoped to invest in a world market leader but invested in a world costs leader," said Alexander Scholl, a representative for Deka Investment who speed-read his statement after Poetsch limited speaking time for each shareholder to 5 minutes. His comments elicited whoops of support from fellow investors. Joerg Hofmann, head of labor union IG Metall and deputy chairman of the supervisory board, defended Poetsch, saying at the meeting that he is the only person who has the support of workers and enjoys the trust of Volkswagen’s major shareholders. At the start of the meeting VW Group CEO Matthias Mueller sought to appease investors but offered little more than an apology for the damage caused by the scandal. What's done cannot be undone," Mueller said in a speech. "What does lie in our power is ensuring we act in a responsible manner. This is our commitment to you." Mueller vowed to accelerate changes to address shortcomings that contributed to the scandal but gave little new insight into the origins of the crisis. VW said 10 employees have been suspended or have left because of the scandal. The company said it has identified deficiencies in its procedures for testing and releasing engine-management systems and will move to tighten compliance systems. Poetsch told the meeting that the supervisory board is studying the possibility of claiming damages from current and former members of the carmaker's management board in relation to the scandal. VW stopped short of committing to cut management pay, with Poetsch promising merely to "review" remuneration policies. Investors were willing to look past the automaker's insular structure in the past when the company was doing well but VW is no longer getting a free pass with its shares down more than 20 percent since it admitted in September that up to 11 million diesel engines it sold worldwide had been rigged to cheat pollution tests. 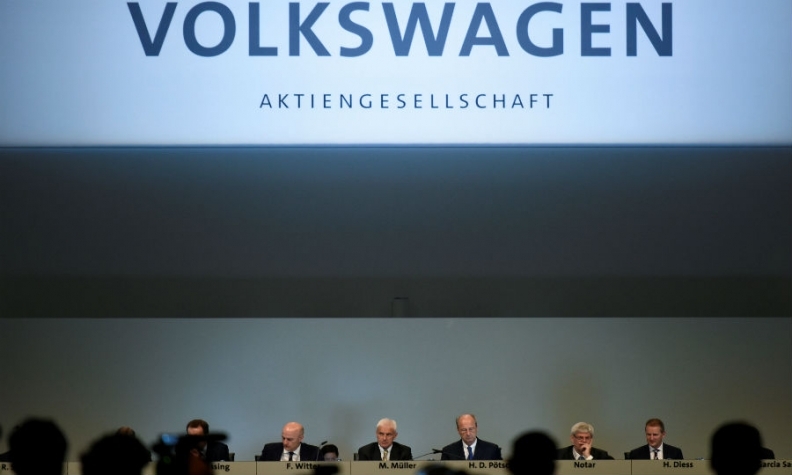 The shareholder revolt was largely ceremonial and the formal approval of the actions of the members of the management and the supervisory boards for 2015 was passed by 93.69 percent of the ordinary shareholders represented at the meeting, VW said in a statement. Minority investors hold non-voting preferred shares, while the voting stock is in friendlier hands. The Porsche and Piech families, descendants of the creator of the VW Beetle, own 52 percent of VW's common shares. Lower Saxony holds 20 percent and has special rights, along with workers, that are enshrined in Volkswagen’s bylaws. That gives outsiders limited opportunity to influence the company, even in the wake of scandal. Porsche Automobil Holding, which controls the Porsche-Piech family stake, voted to endorse VW's former top management at the meeting. Poetsch and Mueller would have liked to have had a more positive message to present to shareholders but a settlement in the U.S. has been delayed until next week, and new allegations have emerged in Germany. On Monday, Brunswick prosecutors opened a probe into whether former Volkswagen CEO Martin Winterkorn was too slow to tell investors about the potential cost of rigging diesel cars to pass emissions tests. Herbert Diess, head of the VW brand, is also being investigated. VW said the investigation doesn’t involve new facts or revelations and had previously argued that the company informed investors properly based on the information available at the time. VW faces legal battles over the scandal. The California State Teachers’ Retirement System claimed on Tuesday that VW misled investors about emissions, seeking damages that could reach as high as 700 million euros if other investors agree to join the action. Another 278 institutional investors sued in March to seek 3.3 billion euros in a lawsuit over the timing of market disclosures. Volkswagen has so far set aside 16.2 billion euros for the scandal, including repairs, legal costs and fines.